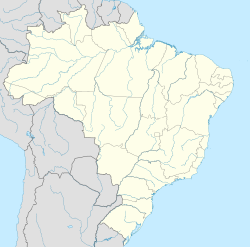 Santo Amaro, also known as Santo Amaro da Purificação is a municipality in the state of Bahia in Brazil. The population is 61,702 (2015 est.) in an area of 492.9 square kilometres (190.3 sq mi). It is located in the metropolitan area of Salvador. Santo Amaro is located approximately 73 kilometres (45 mi) from the city of Salvador. Santo Amaro was home to numerous Amerindian peoples until the arrival of the Portuguese, who developed the region for sugarcane production. Santo Amaro is now noted for its numerous historic structures. The city is also a center of Candomblé, having more than 60 terreiros, or temples of the religion. Santo Amaro was home to Caeté, Pitiguaras, and Carijós peoples prior to the Portuguese colonization of Brazil. The region became an early center of sugarcane production under the Portuguese, with settlements primarily along the Subaé River. It, along with Cachoeira and Nazare, became early regional urban and economic centers of the Recôncavo region. Santo Amaro was part of the municipality of São Francisco do Conde until 1727. The city has numerous historic structures as a result of its colonial past, most notably the Parish Church of Our Lady of Purification (Igreja Matriz Santo Amaro da Purificação). Other historic structures include the remains of the mansions of former sugar barons and a municipal palace built in 1769. The area is noted for its nearby beautiful beaches, the Falls of Vitória, and the grotto of Bom Jesus dos Pobres. The town features prominently in the novel The War of the Saints by Jorge Amado. A cholera epidemic occurred in 1855, killing approximately 50,000 in Santo Amaro and in Salvador, Bahia. Half of the population of Santo Amaro was lost. Doctor Cypriano Barbosa Bettâmio gave his life leading efforts to combat the disease. Santo Amaro covers 492.9 square kilometres (190.3 sq mi) and borders the municipalities of Conceição do Jacuípe, Amélia Rodrigues, Feira de Santana, São Sebastião do Passé, São Francisco do Conde, Saubara, Cachoeira, and São Gonçalo dos Campos. The Subaé River runs through much of the municipality to the Bay of All Saints. Scientists discovered large-scale lead, cadmium, and zinc pollution in the river in 1975, caused by industrial output from a factory owned by the Brazilian Lead Company (Cobrac). The factory operated from 1960 to 1993, but high levels of lead exposure remain among many segments of the population of the municipality. According to the Brazilian Census of 2010, Santo Amaro is 77% Roman Catholic, 22% Evangelical, and 1% Spiritist. The statistics do not take into account Candomblé practitioners. Santo Amaro has both a large number of Candomblé terreiros (60) and a long tradition of religious syncretism between Candomblé and Roman Catholicism. Santo Amaro is home to numerous colonial-period historic structures, many designated as Brazilian national and Bahian state monuments. Maria Bethânia (1946-), singer and songwriter, was born in Santo Amaro and moved to Salvador at the age of nine. ^ "Google Translate". translate.google.com. Retrieved 2015-05-15. ^ a b c Ormindo de Azevedo, Paulo (2018). "Santo Amaro". Lisbon, Portugal: Heritage of Portuguese Influence/Património de Influência Portuguesa. Retrieved 2018-10-30. ^ a b Caroso, Carlos (2011). Baía de Todos os Santos : aspectos humanos. Salvador: EDUFBA. p. 217. ISBN 9788523207618. ^ Robinson, A.; Robinson, G. (2011). Brazil Handbook. Footprint. p. 400. ISBN 9781907263262. Retrieved 2015-05-15. ^ Priego, N.; Lozano, S.; Asociación de Historiadores Latinoamericanistas Europeos (2007). Paradigmas, culturas y saberes: la transmisión del conocimiento científico a Latinoamérica (in Portuguese). AHILA. p. 97. ISBN 9788484893295. Retrieved 2015-05-15. ^ Andrade, Maiza Ferreira de; Moraes, Luiz Roberto Santos (2013). "Contaminação por chumbo em Santo Amaro desafia décadas de pesquisas e a morosidade do poder público". Ambiente & Sociedade. 16 (2): 63–80. doi:10.1590/S1414-753X2013000200005. ISSN 1414-753X. ^ "Síntese das informações (Bahia, Santo Amaro)" (in Portuguese). Instituto Brasileiro de Geografia e Estatística. 2016. Retrieved 2016-12-01. Wikimedia Commons has media related to Santo Amaro (Bahia). This page was last edited on 8 March 2019, at 05:06 (UTC).